As I roamed about the internet this morning I clicked over to Wild Ink Press and looked through her posts and found this amazing DIY project: Homemade Clock. In the short time that I've known about this project I have been emailing it to my friends and family. Pretty soon we'll all have a variation of this clock. Alas, I do not have any wood type laying around for my use, so I'll have to keep my eyes peeled for any interesting numbers (whether wood type or not). Do you have an old wedding dress and no use for it anymore? Explore this possibility: A friend of mine just told me about this new photography trend. After all of the wedding festivities the bride (groom optional) does a second photo shoot in very unusual places: an abandoned house or barn, a river, the lake, etc... During the photo shoot there are no restrictions - the bride may be completely submerged under water or laying down on a street! The end result…magnificent artful photos. The only catch is that your dress may not make it back in one piece. Check out the following link and tell us what you think. poppies, poppies, and more poppies…. During our last mini-craft social when Meghan made that awesome snail pillow (which I plan on stealing from her) the rest of us were working on poppies! I came across the how to on How about orange and fell in love with the idea immediately. 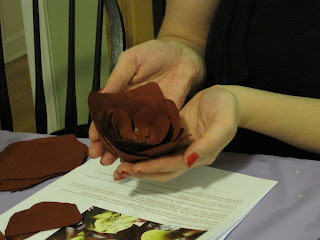 These easy to make fabric poppies make wonderful pins and adornments for anything, the possibilities are truly endless. We pretty much followed the directions to a T. We used hairspray instead of fabric stiffener and it worked just fine, for a fraction of the cost! And to speed up the process we dried them with a hair dryer instead of waiting for them to air dry. I have decided for the center I prefer a button instead of the fabric bunch, a vintage brooch would work great as well! Once the poppies were all glued together I found that they were pretty big, so I bent the petals back in different directions for a flatter look, although the originals look great too. 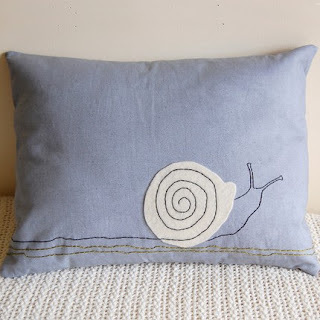 While roaming around the Renegade Craft fair last month I came across the cutest pillow that I wanted, nay - needed, to have and it only cost (holy crud!) $55. How swiftly my dreams of having this pillow on my couch faded. After much longing, Julie and I once again discussed this pillow and thought that I could make that pillow myself at a fraction of the price, and so I did. Julie, a few of our friends, and me all got together one night after work to socialize and do some crafting. Everyone else made fabric poppies (which Julie will discuss later) except for me - my goal was to make this beloved pillow. It was a great night of cutting, gluing, and my favorite - hand sewing. Alison's pillow is admittedly better than mine, but I think I could get it right on the second try. The I pinned it to the gray fabric that I bought and cut. I wanted a 15" pillow, but I didn't think it through well enough and ended up with a 14" pillow. Obviously, I forgot about adding an extra inch so I could have a 1/2" seam. Oops! Here's a close up of the snail. Another thing I'd do different about this (besides leaving room for the seam) is that I'd raise the snail up so you could better see the bottom of it. Overall I love it and instead of $55, this pillow only cost me about $10. 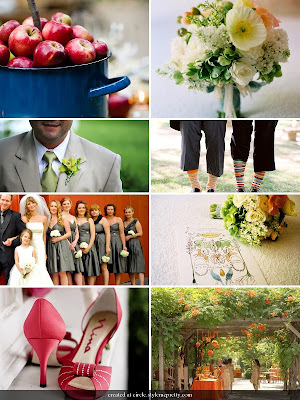 I was bored at work today and checking in with all of my favorite blog sites out there and came across this beautiful vintage wedding featured on design*sponge. The details are amazing and there are so many unique ideas. It makes me want to get married again…. Last week I actually attended the Martha Stewart show! Yes that’s right, little old me got to see the queen of crafts herself. :) It was just as I imagined…. Perfect. Before you actually enter the set, everyone gathers in two holding rooms where they prep you for the show. (No gum chewing, bags and purses must be tucked neatly under your chair, everything in its place) Joey the enthusiastic audience warm up guy does a quick rundown of the shows topics, guests and audience cues, well encouraging loud and jubilant cheering. Then we get to go to the studio. Bright lights, loud music, and pastels as far as the eye can see. An impeccable set. The set is broken into 5 different areas. When you first walk in there is a seating room with a few chairs, a table full of books, and a hutch. The floor is adorned with a beautiful rug. Next the stage opens up into the large kitchen, with white porcelain dished neatly stacked on display and of course the best of the best appliances and kitchen utensils everywhere. Behind closed glass doors was the test kitchen, where there were several people all wearing salmon cardigans scurrying around tasting and sampling dishes. The other two rooms included the craft room and the potting shed. Both staged with every tool imaginable, but of course everything was tucked neatly into its proper place. There were crew members running around making sure everything is just right before Martha came out. As I was seated (lucky enough to be on the floor extremely close to the action) I caught a glimpse of Martha in the test kitchen. I couldn’t believe it, it was really her!!! Then Joey gave us the signal to stand and Martha came out. She was wearing a salmon colored button up blouse and kaki capris. The audience clapped and cheered loudly and the show began. Although the show is not live, Martha prefers to tape as though it is live, no breaks (besides commercials). So the taping went fairly fast, the first segment was shrimp, asparagus, and an apricot ice cream dessert all from her upcoming book, Dinner at Home. (yummy) Next we learned how to make cute clothes from old baggy sweats with guest Carmen Webber, a contestant on season 4 of Bravo's Project Runway, author of Chic sweats. Then Martha talked with the author of Net Lingo, the texting dictionary for all those parents out there who don’t know what their kids are saying. To end the show Martha gave us some quick tips on ironing and broom maintenance. It was an awesome experience!!! To be right there in the action was amazing. I only hope I can go back!